and i feel the same way about Sam. If it cannot be Bilbo because of Sir Ian, it should be Sam's telling of the story to his kids. The time framing would feel much better as you say. In one sense it does pulls on the heart that Frodo did after all traveled west across the sea and it would have been comforting to have him contribute such history to the shirefolk old and new. But it would have been very endearing to have Sam with all his children around him, even later in life. Perhaps they are using Frodo/Elijah because he is prettier lol. Your Gandalf idea makes just as much sense. dissecting the scene where we shift from Bag End as we left it to Bag End as it might have been at the beginning of The Hobbit. I can tell you are just joking because you like the idea of Itaril... there's no way you're getting all negative about Frodo being included in TH. Right? All of the important writing decisions will have been made during the early days, when Guillermo was still in charge. but how far down the rewrite chain does one finally say, yeaaah...maybe you should take my name off that, it's to far removed from where I wanted to go. It really does not sound like the Guillermo del Toro i know and love. It also rubs against a lot of what was said earlier about the layout of the Hobbit films. I'm just saying that GDT's vision would most likely have been different from PJ's take on some things. This is exactly the opposite. It is much more like pandering to the studio's desires, and we all know how GdT feels about that. Rumors have suggested Wood is "in talks" to appear in the film but that isn't an issue as it very likely the role was discussed with the actor at the scripting phase of the films and he was agreeable to reprise his part then. but while it appeared that GDT wanted to remain true to The Hobbit proper, it did not seem like he was opposed to the idea of book-ending (or even peppering) it with elements from LOTR or the space/time between them. But maybe my read of his intentions -- someone I only "know" through this forum (if that even counts) and his commentaries -- is wide of the mark? Hence "going out on a limb." Come to think of it, it is not entirely fair to say this is pandering to "the studio's desires." Even I am torn between seeing The Hobbit and seeing as many LOTR characters again as possible (and I should know better lol). Maybe that's why we call this place TORn? RosieLass is entitled to her opinion whether you agree with it or not. I'm sure she's not alone, and it doesn't take two, or two thousand, other people to make it valid. Either way, please take this to PM if you want to continue, as you've both stated the same points several times now. I can't wait for the book G is free to write (and said he might write) after his NDA wears off. Can't be any more whiney then Sean-everythingwassoterrible-Astin's book. Elijah Wood is going to be hounded by the press a bit more now. I wonder if he'll deny it or just say no comment? never far from his publicist. I saw him on Mad TV one time where a "correspondent" of their's was covering the premier of Happy Feet. The correspondent asked Elijah for a kiss but the publicist (off camera) said "NO!" and I guess my point is this. Looking at how GdT has structured the films he has made, this wrapping of the main story with a structure that is primarily aimed at bringing back LotR cast members does not seem like his idea. Of course there were three other writers who would be much more likely to like this direction and he would be out voted. I hate to say it but this could have been one more small reason for leaving the production. (I still think time was the primary motivation). Her I would like to say that I do not believe that the story within a story structure is necessarily bad. It depends on how it is implemented and if it does justice to both plots. 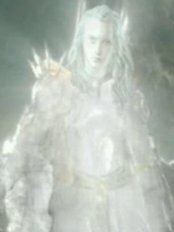 A haunting shot of the two of them holding on and flailing in a beautiful last embrace, as they sink down and down, with an angelic light about their heads, Drodo looking especially majestic, and all set to Shore's poignant music--so the viewer can later tie it in with Sam at the end of FOTR.. "They're dying as martyrs--like Tuor and Idril giving life to Earendil, and then departing Midde-Earth!" Sorry, Sir Dennic, I couldn';t help it. Hola to you too--Yeah, I went away for a while--RL is like that. But I wrote a long Christmas mathom (look for it in the Mathom thread in OT) and posted a bit in the Holday Fiesta thread. Happy New Year! I missed everybody.